That’s right. Ninja Day 2010 is three days away on Sunday, Dec 5, 2010. Are you ready? If you keep turning around thinking you’re hearing something behind you, don’t be scared. It’s just Ninja Day creeping up ninja-style ready to gut you like a rainbow trout. Just go with it. What do I have planned? Well, on Ninja Day I’ll discuss a popular 80s ninja movie and some of the behind the scenes drama that almost led to it not being released. Next week, I’ll continue Ninja Day with a bunch of reviews of ninja movies. Most are vintage 80s, but one was released last year. So come back on Sunday and next week, sit back, relax and let the explosive awesomeness of badass ninjas fighting fill your heart with warmth and love…and death. This entry was posted on December 3, 2010 at 11:09 am and is filed under 80s, movies, ninjas, pop culture with tags movies, Ninja Day, ninjas, pop culture. You can follow any responses to this entry through the RSS 2.0 feed. You can skip to the end and leave a response. Pinging is currently not allowed. 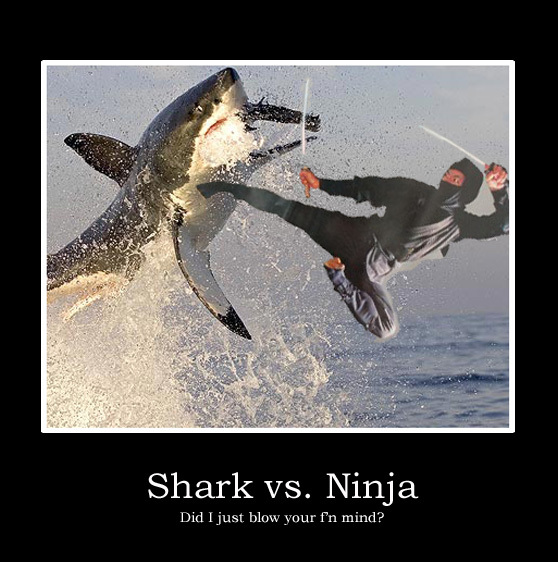 Love me some ninjas, ‘specially when they’re fighting A) sharks or B) zombies.